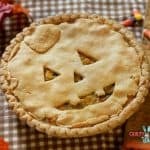 Make this Jack-O-Lantern Healthy Chicken Pot Pie Recipe for a fun and festive Halloween dinner! I love Fall. It is my absolute favorite time of year. Though I don’t like COLD weather, I do like nice crisp mornings and snuggling up with Mike in front of the fire in the evenings… following an amazingly tasty meal. This year I am already preparing for the holidays by making recipes that are as healthy as they are delicious – and even sometimes making myself a completely different meal than my family… after all, *I* am on this diet, not them. Tonight I made my very first ever Chicken Pot Pie – a “healthy-ish” version for me, and a “normal” version for them. To be honest… I could not tell the difference between the two. Both of them were delicious and I am excited to have a new, simple meal to add to my repertoire. In a medium sauce pan, mix milk, pepper, flour, and poultry seasoning together over medium heat. Stir in chopped onion and cook about 4 minutes or until sauce is thickening and onions are soft. Add cream of chicken soup and mix well. Slowly add in cooked chicken and vegetables and mix well, lowering heat to low. Spoon mixture into empty pie crust. Gently lay second pie crust over top and using a sharp knife, cut out eyes, nose, and mouth and discard cutouts. Use extra dough to make a “stem” if desired. Bake 30-35 minutes or until edges are bubbly and crust is browned. Yum! I LOOOOVE Chicken Pot Pies. My wife made me a healthy one once which was great, but she made the crust herself to be healthier, so it was a bit of a project. I’ll have to share this with her to give a try! Oh that looks good! 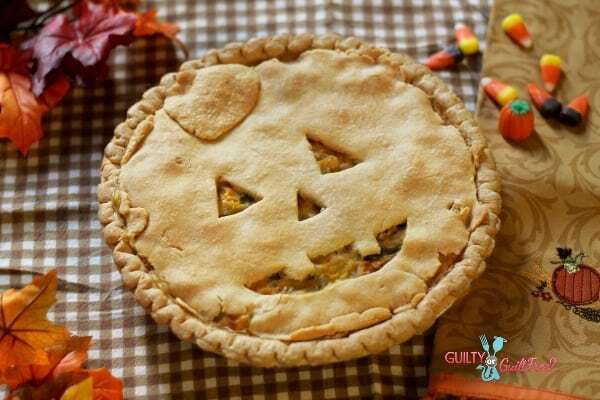 I love the Halloween face – who could not resist that awesome pie. Go Chef Lynsey! YUM!! I think I’d make my own ‘cream of’ soup so that it has less sodium, but YES! I will be making this! Love the cut-out on the pie crust. So excited for fall and Halloween. That pot pie looks delish. This is too clever, and you’re making me hungry. Must. Pin. Now. Your pie looks delicious! I have wanted to make one for weeks, and just kept putting it off. Maybe this weekend. I’ll pin this to remind me. That is a nice hearty winter dinner idea to make the kids on Halloween night! I love chicken pot pie! WOW – this looks delicious! Perfect for this cooler weather, too. I love the jack-o-lantern face, and the super simple ingredients and instructions. Thank you! I’m loving that pumpkin face on your delicious looking chicken pot pie. I’ll have to try your recipe this week, I think I have all of the ingredients and the kids will love the Halloween spin on it. This would make a great hearty mid-week dinner. Chicken pot pie is so flavorful and can be enjoyed by all. I love a good pot pie. Love the halloween twist you did for yours. My boyfriend love chicken pot pie, this one is so cute! I absolutely love chicken pot pie! I don’t have the confidence toake it myself though. Your pot pie looks so delicious!!! Wow! My family would loved this,a mouth-watering food. Can’t wait to taste this delicious and healthy chicken pot pie. Well done! What a great meal to prepare for Halloween dinner! Thanks for sharing this. I love the face in the crust. Wow! My family would loved this too. A mouth-watering food. Cant wait to taste this delicious and healthy chicken pot pie. Sounds good. I love chicken pot pie! I will made this on Friday thanks for this idea. This is a great idea this coming halloween. My kids would love this. That is too cute! I’ve been wanting to make pot pies for a while now and havent got around to it. What a cute pie. I love easy recipes like this. I will bookmark this for later. I love homemade chicken pot pie and yours looks too cute! My son would love it! So cute and it sounds delicious! I love that we have healthier versions of our favorite recipes and that makes life so much better! Thanks for sharing this recipe! Oh yum, I love this idea. We’ll need a warm meal like this come Halloween night! Now that’s a pie worthy of being selfish and stingy with. How cute is that?! I’ve been wanting to try a chicken pot pie lately, and that face just sold me!! The pie crust is my favorite delicate feat for the eyes! You make me hungry right now! I wanna grab this from my screen lol. This is great idea this coming Halloween I’m sure my family would love it. Thanks! Oh, how I love chicken pot pie! Your recipe is just in time for the cooler climes here! I look forward to trying it. I do like chicken pot pie – especially homemade – and this looks yummy! Thanks for the recipe. I would love to make one for my family but my oven broke down and I have to get a new one. Hoping I could replace it before the holidays! Oh my! that looks cute and delish to eat. Thank you for the recipe. This is so cute. Thank for linking up with us this week. That looks absolutely delicious. I can’t wait to try your recipe. My father and one of my sons absolutely love pot pies. I’m going to have to try this one! thank you for sharing such a simple healthy meal. I am going to make this tonight!